Preventative Care & Patient Engagement is based on active participation of the patient and positive involvement of the family members. This sometimes includes changes in life style including habits such as quit smoking, changes in diet and exercise regime. Patients who measure their vitals on a regular basis also tend towards proactive changes improving overall health. Healthcare organizations can support patients by providing rich and easily accessible video content to encourage life style changes. Home care agencies can also proactively encourage clients to participate in agency lead programs such as exercises and community based walkathons. Technology should enable home care agencies to engage these clients into proactive roles and thus into preventative care. Remote Care consists of two key components: Remote Patient Monitoring and Virtual Visit. Safety Labs platform supports both. Remote patient monitoring (RPM) enables monitoring of patients outside of conventional clinical settings (e.g. in the home), which increases access to care and decreases healthcare delivery costs. Reduce hospital readmissions and ER visits. Enable decision support with threshold alerts of negative trending vitals (Vitals Analytics – see Personal Health Index). Filter and score clients based on clinical data to help prioritize. Configure monitoring plans based on client conditions. Enable regular and constant “touch” with client conditions. Virtual Visits – Sometimes a client only has a quick question or needs services that do not require a visit by a home care provider or in-person visit with their health care provider. Sometimes home visit by home care agency is difficult and is a burden due to distance, or time limitation because of inclement weather or late at night. Virtual visits, also known as e-visits, are secure, two-way digital communication between health providers and their clients/patients that can include videoconferencing and emails, text messaging. Virtual visits enable patients to communicate with their health care team from wherever they are, and in a way convenient for both the patient and the provider. Video conferencing is an ideal way to communicate as it is a two way simultaneous communication, reducing total time used and reducing chances of misunderstandings. Right care at the right time make the difference between a doctor’s visit for a regular check and a visit to the ER. Using Safety Labs system, you will be able to reduce avoidable ER visits and hospitalizations. Delivering the right care at the right time is essential in any population health approach and this early identification is especially vital in a value-based payment system. Providing continuous care at home is not only cost prohibitive to general home care client population but is also not necessary. 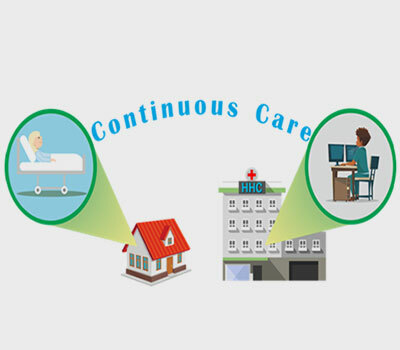 However continuous care does improve the probability to provide the right care at the right time, reducing readmissions and reducing care costs. Remote care technology should support remote and continuous care options such as RPM and care provider driven schedules. Social Media & Games keeps a client occupied and hence keeps her happy. Features like Family Album, Games and Contacts enables clients and residents to be engaged and stay in touch with family and friends. Simply staying connected and occupied contributes to keeping a resident/client occupied and happy. What is EVV The EVV system must verify each service provided. To EVV be compliant with the 21st Century Cures Act, an EVV system must electronically verify i) Type of service performed ii) Individual receiving the service iii) Date of the service delivery; iv) Location of service delivery; v) Individual providing the service; and vi) Time the service begins and ends. Since EVV provides proof of services completed by home care workers and nurses, it helps prevent fraud and abuse in home health care. Safety Labs wearable pendant based EVV system not only uniquely identifies the caregiver but also brings up the picture of the caregiver on the TV to assure the client of the identity of the caregiver. The wearable pendant can be used in case the caregiver needs to send an emergency alert to the operation center while delivering care or while travelling to or from work, ensuring the safety of the care staff. Patient care interaction today is based on telephone calls originating from home either by the patient or their caregiver. The call is made if they either have a need to address a query, an issue to resolve, or if the patient condition has changed and requires immediate care. This need for clinical support is not limited to business hours, meaning that patients and their caregivers also need support in the evenings and weekends. Ensuring appropriate and timely care with uncertain timelines is a major challenge for the management and staff of homecare agencies. a) Patients and their caregivers today are more engaged in their own health, indulge in self-care and, if given the proper tools, will explore and address their own issues. b) Rich, vibrant, and professionally vetted and catalogued video content made available to patients would address most of their questions, many times better than if the same topics were addressed via a voice call by a nurse. c) Average call numbers can be reduced by providing self-help options. Today patients deserve and demand better services. To achieve high patient survey star rating status quo is not enough—each agency needs to provide quality services engaging their client which would help make the home health care agency’s services stand out from the rest. Care of patients How often the home health team gave care in a professional way. Remote care solutions enable Home Health Agency staff to be in touch with clients without incurring the cost of making in-home visits. Communication between providers and patients – How well did the home health team communicate with patients- Technology assists providers and patients to be in touch more regularly and efficiently. Self-care patient engagement platforms enables patients to be proactive, improving overall patient health, and reducing their dependency on homecare agency staff. Specific care issues – Did the home health team discuss medicines, pain, and home safety with patients – Patient engagement platform provided using wetted professional multi-media videos addressing specific patient concerns enable Home Health care givers to address patient issues. Built in Nurse call system and Wandering protection systems address patient’s safety concerns. Global measureGlobal measure – How do patients rate the overall care from the home health agency – Keeping in regular touch with a customer providing reminders and safety solutions through the care continuum, keeps customers happy and improves ratings. Increased revenues – System provides new revenue opportunities such as RPM and Virtual Visits CMS and private insurance coverages. Reduced care costs – Reduce travel for in-home care, increase engaged patient, reduces call volume and call duration requirements. Reduce readmissions by providing right care at the right time. Continuously monitor patients and provide alert when care is required. Ability to immediately alert physical or medical emergencies. Increase client satisfaction improving star ratings. A life, work balance where care providers can care for many of their patients from their home. Reduce travel time for in-home visits. Reduce client calls and reduce call durations. Ability to efficiently be in continuous touch with patients. Communicate and collaborate with caregivers. Prioritize work roaster based on medical conditions. Communicate and collaborate with care providers. Prioritize clinical staff roaster based on client medical conditions. Increase the safety and security of employees. Increase compliance with detailed audit trails. IT staff benefits from easy to manage remote care solution. The system can be completely managed using web-based Interface. Zero downtime environment hosted in AWS IaaS. Eliminate paper processes, including paper schedules and time sheets. Export data with automated report building to generate pivot tables, business intelligence and real-time data reports. Privilege based access controls enabling complete control over security. Secure HIPAA compliant cloud servers.